Slicing an onion for tasty fajitas is easy enough, but it's important to slice it in a way that will give you even slices. 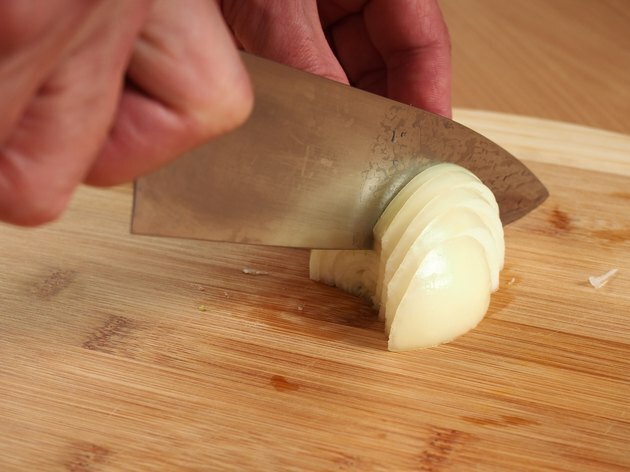 While cutting an onion in half, then making horizontal slices is easy, it results in slices that vary greatly in size. When you're cooking onion slices, as you do with fajitas, they need to be equal in size to prevent some slices from cooking faster than others. Making radial cuts, following the lines of the onion from stem to root, takes a bit more technique, but will give you slices that are almost perfectly even. Peel the onion and cut it half, from the stem to the root end, on a clean cutting board. Lay one half of the onion on its flat side on the cutting board. Trim off the stem end, as well as the root end of the onion. Turn the onion so one end is facing toward you. This position allows you to easily make the radial cuts from stem end to root end. Position the knife on one side of the onion, closest to cutting board and at an angle so you are following the lines on the onion. Make the first radial cut into the onion, which should release a slice with onion layers that are all even in length. Reposition the knife on another onion line and repeat. Space out your cuts so the width of the slices are the same size as well. Continue making radial cuts into the onion, until you reach the center. The remaining onion will wobble at this point. To keep it sturdy, lay it down on its side and repeat, making the same radial cuts into the onion until it's fully sliced. To make basic chicken fajitas, cook sliced chicken breasts in an oiled skillet and saute sliced onions and bell peppers in another oiled skillet. Combine the chicken and the vegetables in a warm flour tortilla and top with shredded cheese, sour cream, pico di gallo, guacamole and lettuce.